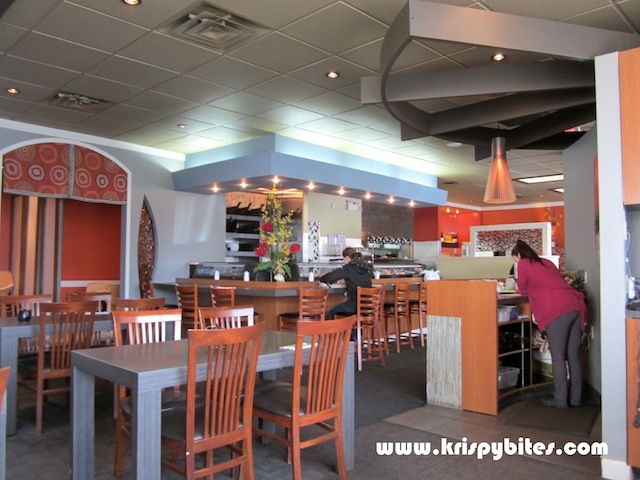 Kyoto Japanese Cuisine has 2 locations, but it's a bit confusing because both locations are on 109 St. One is on 109 St and Jasper in downtown; the other is in the same strip mall as Menchie's Frozen Yogurt in Garneau. Unlike most other Japanese restaurants, Kyoto does not close between lunch and dinner hours, so it's very convenient for an afternoon sushi fix. 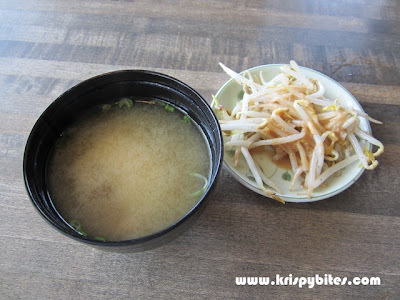 We stopped in for a late lunch and were happy to find that everyone received complimentary miso soup and a side dish of bean sprouts with sesame dressing. The bean sprouts had a grassy taste and the sauce was thick and chunky, but no complaints since it was free. 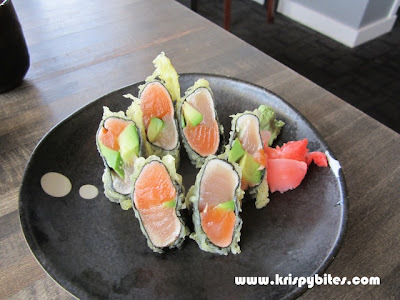 The isobe maki ($8.50) looked really good on paper: salmon, tuna and avocado wrapped in seaweed and deep fried in tempura batter. The presentation was appealing as well, but the dish fell short in flavour. 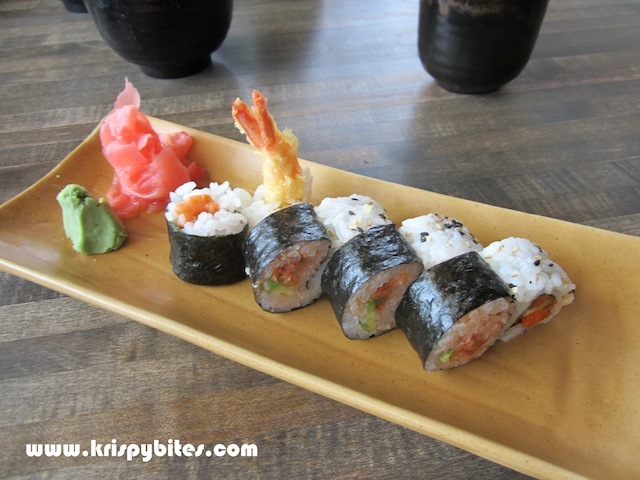 Because there was no rice or seasoning and the fish wasn't particularly fresh, this roll was very bland and boring. The Kyoto special maki ($8) was a two-in-one roll with an innovative appearance. This black-and-white maki was in the shape of a figure 8 with spicy tuna in one loop and dynamite (shrimp tempura) in the other. Considering the price tag, I found this dish to be too expensive for what it was — one tempura shrimp and minute amounts of mashed up marinated tuna in rice and seaweed. 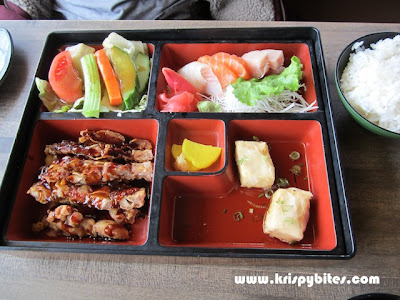 Bento Box C ($12.30) featured teriyaki chicken with rice, salad, several slices of assorted sashimi, and two pieces of agedashi tofu. It was standard fare, nothing special. 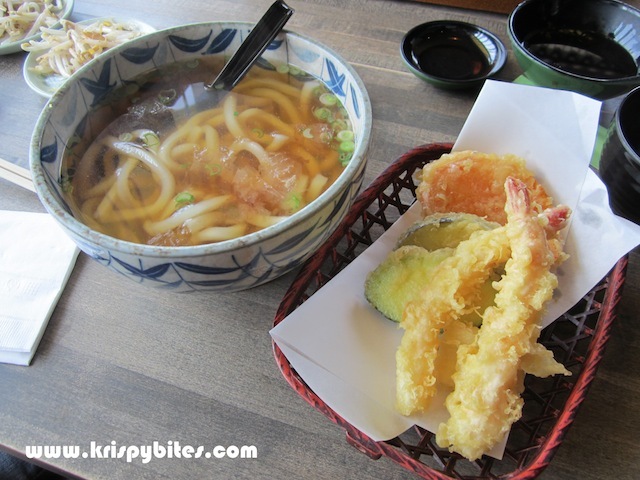 The tempura udon ($11) was comforting, and was served with a good portion of assorted tempura on the side. Overall I had a decent experience at Kyoto, but I realized the sushi is rather overpriced for the size. Both of the rolls we ordered were underwhelming, so I'm not too interested in trying the other sushi here. The bento and udon were pretty good value though. Just in case, for price comparison, are you using Vancouver as yardstick? If so, alas, pretty much all sushi you will find in Edmonton will be more expensive. In a way, I have pretty much given up that search for decent sushi in Edmonton at decent prices. I have been to Furusato, Mikado, Japonais, Nomiya and Wasabi and, while the degree of sucess varies, it simply won't be like Vancouver. I still haven't been to a few of the places you listed. I'll definitely be checking them out!